Since its inception in 2005, the INBONE™ Total Ankle System has continued to be the most distinctive and innovative total ankle replacement system on the market. 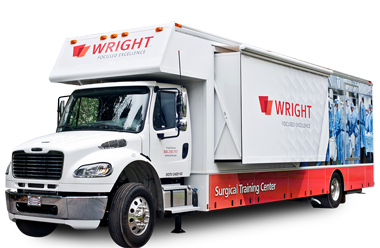 By offering the first total ankle system that provides intramedullary instrumentation (utilizing the vertical axis of a patient’s shinbone) for accurate component positioning and the first ankle prosthesis with a modular components for patient specific needs, Wright Medical continues to redefine innovation in ankle arthroplasty. The INBONE™ Total Ankle System is a modular prosthesis installed via the first and only intramedullary alignment – PROPHECY™ INBONE™. This is a major advancement for precise, reproducible installation. When it comes to joint implants, one size does not fit all. The modular design of the INBONE™Total Ankle allows the physician to select the appropriate components based on patient size and bone structure. This results in a more precise fit and less-invasive procedure. 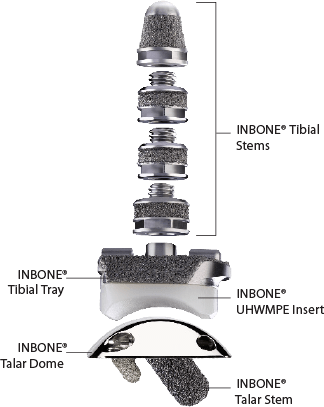 The INBONE™ Total Ankle System consists of a talar dome with a modular talar stem, a tibial tray, a four component tibial stem assembly that attaches to the tibial tray, and an ultra-high molecular weight polyethylene insert (UHMWPE). All components are available in varying sizes to best match your anatomy.